I grew up in a bookshop. I mean that quite literally. My parents separated when I was about 5 and my siblings and I went to live with my mother. Every Monday and Thursday (and “every-other weekend” a phrase well-know to children of divorce), my father would pick up my siblings and I and take us to (at the time) the only restaurant in my home town, a sports bar where we ate buffalo wings bi-weekly, that shared a shopping center with a Barnes and Noble (which was also the only place to get coffee in my town). I bought my first chapter book at that Barnes and Noble. My father would let us all run wild we would spread ourselves across the shop with our novels (back when Barnes and Nobles still had cosy chairs and couches). We were allowed one book a week, two if we bought one of those B&N classics because they were cheaper (and why, to this day, I’ve read mostly classics). I love bookshops. Even chains. I know it’s cheaper these days to buy online, but the bookshop was a founding principle of my literary career. I hold on to them with romanticized nostalgia that no longer belongs in the digital world. 1) A lot of books. This is important because… well, obvious reasons. I want to feel like, when I’m in a bookshop, I am drowning in books. If an earthquake suddenly happened, I would like to think I’d be buried alive in there. I want all genres. 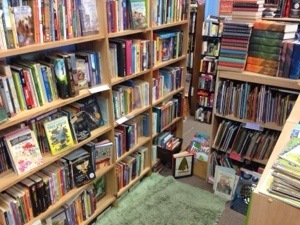 Blue Cypress has an entire extra room just crammed full of Fantasy and Sci Fi (with a little bit of travel and, oddly, memoir squeezed in), a whole nook of Children’s Lit, and even a case or two of collectibles. 2) A really awesome staff. 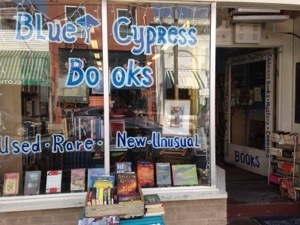 The thing I love most about Blue Cypress is that, while it’s so small it’s mostly staffed by it’s owner, she knows a lot about books. An adorable blonde woman who has read every book I’ve ever come in asking for, she and I never run out of literary subjects to discuss. They also do this really helpful thing where the staff all labels their favorite books. Once you get to know their tastes, it’s like a huge flashing sign telling you what you’d like to read next. 3) Some sort of adorable animal. I used to take the children I babysat to Blue Cypress to help me regain my sanity momentarily. They have an adorable cat there that the tots would chase around to their hearts content while I actually got a moment to pick books. Aside, from the one time I had to peel the terrified cat off the littlest’s head, this was my favorite thing. 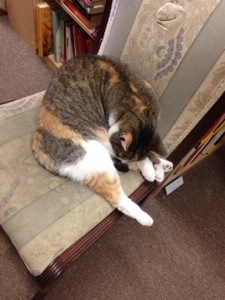 Plus, there is nothing like a cat rubbing against your ankle while you peruse the poetry section. 4) Fair pricing. I switched to used books soon after becoming poor. Let’s be honest, books are insanely expensive. (Plus, I love a well-loved book!) Even still, some used bookshops charge almost-new prices. No thanks… I want to fill my life with books, not empty my bank account. Bonus points if they offer rewards programs for book addicts like me. 5) Ideally, a couch. I used to sneak into my college library to take naps because they had chairs more comfortable than my dorm bed. I’m not saying, if my bookshop had one, I’d be snoozing there or anything (possibly, though), but I’m the kind of person who always reads the first chapter before they buy. An awesome, little reading room would really seal the deal for me. 6) Coffee. I don’t know why, but coffee and bookshops are inextricably linked. They just seem like they belong together–or maybe that’s just coffee and everything (or, better yet, books and everything). Granted, this is a bit of stretch for small bookshops, but I think coffee would turn a bookshop into my heaven. 7) Secret rooms. Another awesome bookshop in New Orleans (which, sadly, recently downsized and lost this feature) was in a cute little house that twisted its way towards the back. This was great. Nothing like getting lost in a little shop and finding yourself in the parallel universe that is Avant Guard Architecture or whatever random special interest you happen upon. Plus, this is the best place to hide with your shameful reads. Bookshops will always be akin to my home, but if I had a bookshop with all of these things… I think they’d have to drag me out of there every night. What about you guys? Can I ask you just one question: Do you feel literary? Well, do you? I’d let my book get stuck in my head and, other than a few measly scenes that were all wrong, I hadn’t written much of use this whole week. So I sat down and–in a text-only version and therefore unable to edit–I read my entire book today. You know, these things get so mental and detailed, that you forget to just enjoy your story. Could my sentence structure be better? Yup. Were there plenty of cringe-worthy typos? Of course. But was the story there? Did I manage to read the whole thing in one sitting? Yes. It doesn’t matter as much what other people think. I genuinely enjoyed reading my book today. I enjoyed reading it as if someone else entirely had written it. I found myself worried for the characters, even! Worried about the characters I wrote! Can you believe that? It really helped get me back on track, to fall in love with my own story all over again. So, a week after finishing Chapter 17, I started 18. I wrote 1,300 words in the past 45 minutes (more than I’ve written all week… at least on this project) and completely rearranged my ending. The ending is still there, I just need to write it and now I see why it had been causing problems, clear as day. I’ve also figured out a huge detail at the beginning that will solve my two biggest problems. A) It’ll add a bit of excitement to the beginning and really up the stakes for my protagonist (thank you to Amy for pointing out how much potential this detail could have) and B) be a really good motivational factor/bonding point for my protagonist later. Day Thirty-Four: Traditional Publishing is Dead? I spend a lot of time reading technology and writing blogs (not just on this site, but everywhere). In this day, you have to. Last night I came across a blog where a young writer such as myself who had undertaken a similar project, completed it, and sent it to traditional publishing houses only for it to get rejected. He was thereafter thinking about making the jump to self-publishing and had lots of interesting input from editors and proofreaders encouraging him to do so–his work was good, there really isn’t much rhyme or reason to how a novel gets published. It was weird how much this floored me. When I think of self-publishing, my mind automatically jumps to those one-dollar-to-free novels I buy on my Nook. Honestly? They’re horrible. I’ve read third grader’s essays that are better proof-read than some of those guys. I almost wanted to reach into my screen and tell this blogger not to do it! It’s literary suicide, I thought! I still live in some outdated vision of literature. I’ve had an e-reader for a few years now, but when I think of a book, I still think of just that. A book! I want to hold it in my hands. I want to turn the pages. I want to find it on my shelf smiling at me like an old friend. I want to leave it by my best friend’s bed to read when I’m done. I buy digital copies sometimes, but they’re copies. I know somewhere out there that book actually exists. Today I read a few blog posts about how to actually make money as a writer. One guy starts going on about how publishing houses are monopolies that produce nothing but trash and the only way to create real work was by self-publishing (and that’s not just digital copies, there’s a million forms of it). Essentially, he destroyed my every romantic notion of being a writer. You hear that when it comes to writing, content is king. This doesn’t really make much reference to the quality of the content so much as the quantity. I’ve heard of novelists in self-publishing that put out books every few weeks. This seems impossible to me. I’m trying to write a big story here. Every day it overwhelms me with how big it is. I can’t imagine writing it any faster without reducing the quality. Would it be better to be writing sub-par novels once a month in order to make a buck? God, do I even need to answer that for you? I’m sure there are people out there who make great money, and probably produce quality work in very little time (On The Road was written in three weeks, but don’t let that discourage us. It’s a very short book). But even then, that’s not the end-goal of my project. I always had this rather childish fantasy of walking through a bookstore (and let us not get into the fate of the bookstore! Call me sentimental, but I don’t want to exist if bookstores do not) and finding my book on a shelf. I want to hold it. I want to open it to my favorite passage and sit right there on the floor of the shop to read it, like catching-up with a long-lost relative. I want to write my name in it and leave it for the next passing soul to pluck it from the shelf. I want to hold my book more than most people want to hold their first child. But it’s more than that. I want someone to read my book. I want to have something worth saying that I can convey in such a way that makes this fragile language of ours make sense. I want someone to leave my book by their best friend’s bed. To dog-ear the pages. To leave scraps of paper between the pages bookmarking their favorite passages. I want someone to love my book as much as I have loved books. I guess the heart of that romantic notion is just as easily accomplished with a self-published book. You’d cut the legalities. The Middle-men. The monetary vultures and hangers-on sucking the life out of my work just to make a buck. But I want to believe that there is still a heart in the publishing world that’s merely helping make my book as good as it can possibly be. That it takes a lot of great minds to make a great book. It’s a literary sea out there. 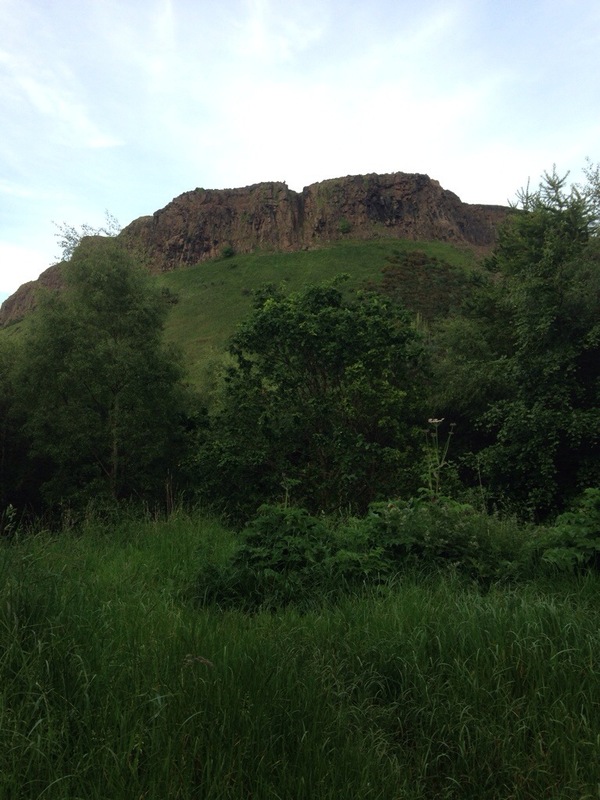 It isn’t a jungle. You could drown in all the books in the world, both digital and physical. I want my book to float.